When you go to install your in ground trampoline, you have to do a lot of digging. That digging results in a nice wall of dirt that needs to remain where it's sitting. 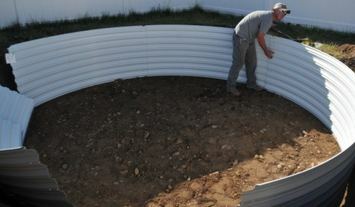 Building a good retaining wall is one of the most vital parts of an in ground trampoline installation. The retaining wall provides support for your trampoline, keeps your yard looking great and makes sure you do not have any cave ins that will cost you a lot of money in repair work. From DIY to retaining wall kits, there are a lot of options when it comes time to build your retaining wall. 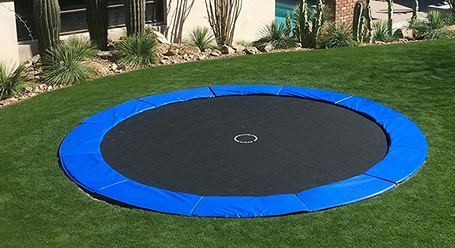 Just continue to read our article to get all the information, tips, and ideas you need to have a very successful in ground trampoline installation. Tip #1: Do not confine your outer hole to your trampoline’s diameter. Add a foot all the way around to make room for your retaining wall and ventilation system. There are a lot of good retaining wall kits for sunken trampoline son the market. Unfortunately, space does not allow us to review them all. The following two reviews of retaining wall kits should give you an idea of what to look for when you go shopping for a kit. 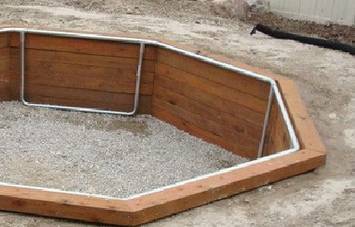 It comes in sections making it easy for one person to put the ring together and get the retaining wall in place. An easy to install top molding piece holds the different sections together. Once put together, the retaining wall should hold a 15 foot trampoline with ease. Just make sure to dig your hole wide enough to allow for ventilation and proper drainage. The main benefit is in its durability and strength. Also, this retaining wall is not very wide. It won’t take up a lot of space after it is completely installed. One of the key qualities this retaining wall kit has to offer is that it is flexible. It can protect a 12 or 15 foot trampoline hole. This gives you a little flexibility when considering which trampoline size to go with. Then stainless steel hardware makes sure you get the best rust and corrosion protection without sacrificing strength or quality. Plus, its thin construction allows you to do less digging. The retaining wall does not take up a lot of space. Also, the retaining wall is designed to make sure you do not have additional issues with ventilation, or drainage. It shouldn’t be too difficult to install. Galvanized to protect against rust, etc. 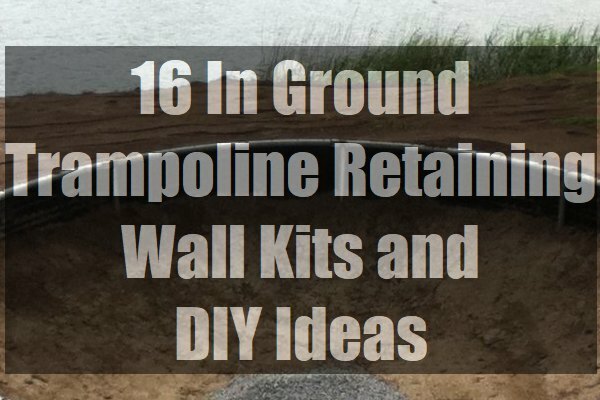 Tip #2: go with a reputable brand when you buy your in ground trampoline retaining wall kit. You should get better service, better return options, and people to talk to when you have an installation problem. You should also get a better warranty. When people want to construct something on their property and do not know how to do it properly, they do come up with some pretty interesting ideas. These creative ideas may work for the short time but they do have their flaws. A very strong solution to your retaining wall issues. Steel is durable if treated to protect against rust and corrosion. But the main drawback to this system is that it is also very heavy. You run the risk of injury if you do not handle it right. Also, you may need a lot of help moving it from its above ground location into its retaining wall position. It is probably the longest lasting non-professional idea you can use. These have been used as retaining walls for gardens and other landscaping projects. They are treated and the treatment should keep the bugs away. Also, they are a bit heavy but a lot easier to put in place. You may only need a sledge hammer and some steel rods to hold them where you put them. There are two main drawbacks to using railroad ties. First, they may be difficult to cut to size and fit inside a circular hole. They will work well for a rectangular hole. Second, water is their enemy. Too much water may ruin the railroad ties and weaken them. In these systems, and there are not that many on the market, you have the trampoline as a part of the retaining wall kit. Their benefits include looking nice, you do not have to install a trampoline frame and more You still should get a good bounce. Plus, all the parts to install the retaining wall and trampoline are included in your purchase. You do not have to keep going out to find parts you need to use. Installation goes a lot quicker and you may get your kids on the trampoline faster than other retaining wall systems. You can get away without using a retaining wall when you install your trampoline but this system is more of an example of what not to do. 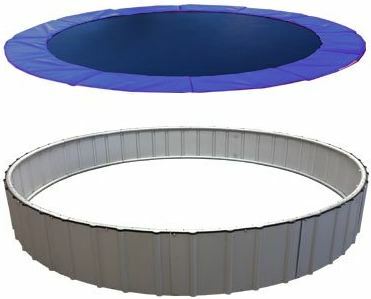 It cuts corners, saves money a yet it adds more risk to you and your family’s trampoline time. To make this system work all you do is dig your trampoline pit and then lay your trampoline, without legs, across the hole. The main issues with this system is it does not allow for proper ventilation, it does not support your dirt walls and they can cave in. Also, it will make a mess of your yard. 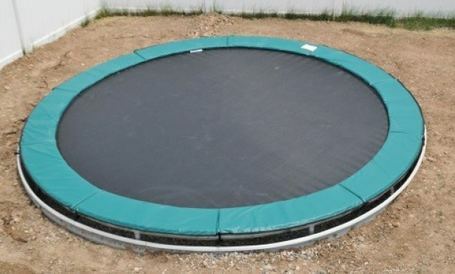 Believe it or not, there are people who have used this idea when they want an in ground trampoline. Tip #3: When DIY don’t cut corners or costs. The better the retaining wall the safer your in ground trampoline will be. Also do not be lazy. Do it right the first time and you will save more money in the long run. This is a lightweight retaining wall that is simple to put together,. It is not made from metal, has no metal sharp edges to cut yourself. Other edges are rounded to make sure you can handle it without fear. Also, it comes with an interlocking system that makes it very strong and capable. You just snap it together and then use the self tapping screws to lock the system in place. It shouldn’t take you a long time to build. If you want a classy retaining wall this should do it. Bricks are easy to get and all you need to do is figure out how many you will need. We suggest a double row to make sure you have the strength. All you do is mix then mortar and then lay down a foundation to place the first bricks on. Then you continue to buildup till you get to the right height. You do not want mortar that is too dry or too wet. This is time consuming but your retaining wall should look great and last you a long time. The time is in the building of the form. You can use the dirt wall as one side of your form so all you need to do is build the other side. Since there will not be a lot of pressure on the form, you should be able to use either 2 by 2 or 2 by 4 stakes to hold the boards in place. Once you get the boards cut to size, name them to the stakes and put them in place. You will also need some braces to help the forms hold the concrete. 2 by 4s are good for this and nail one end to smaller wood stakes you have driven into the ground. Again, you do not want the concrete too wet or to dry. You want it to set up quickly but you will still have to wait a day or two before the forms can be removed. Do not forget to add rebar to the forms for the concrete to grab on to. A lot easier than using concrete. You will still need to figure out how many blocks you will need to use and you will still need to use rebar to help the concrete get its full strength. To build this retaining wall, you first lay down a little concrete on the outer hole’s ledge near the wall of dirt. Place your first row of blocks down where you need them to be making sure they touch. Continue to do this till you have reached the top[ of your retaining wall’s height. You can use your trampoline’s steel frame as support for your retaining wall. You will need to pre-drill holes on each frame leg. This may take some time as drilling angles is not easy. Then you drill holes in the pressure treated 2 by 4s you have bought. Once the holes are drilled, you take a large & long lag bolt insert it through a washer then put it through the hole in the 2 by 4. The lag bolt will have to be long enough to go through the metal leg of the trampoline. When that is done use locking washers and nuts to secure the 2 by 4 to the metal leg. Continue to do this till the metal frame has 2 pressure treated 2 by 4s per frame section. After this is done, cut the sheet metal to size and then screw the sheet metal to the 2 by 4s. Go all the way around making sure you get a tight fit. Then when you have completed that task, lower the frame sheet metal wall into your hole. Attach your trampoline mat after you got your ventilation, drainage and weed issues taken care of. Make sure the frame is placed level. You can do this by using along 2 by 4 and a carpenter’s level. Tip #4: when using concrete, whether pouring in a form or concrete blocks. you have to make one pour. More than one pour ruins the integrity of the concrete and makes the wall weaker. No matter how you build your retaining wall you will have to do some minor work to make sure everything fits well and provides you with the support you need. These little duties include back filling, leveling, and even smoothing out the concrete. The key to building a retaining wall is to make sure it is strong enough and will last you a long time. As you build your retaining wall, you should make sure it will work with your drainage system and weed barrier. A good retaining wall will add to you hours of fun using the trampoline. It will also save you a lot of money over the years. Tip #5: Before you build your retaining wall, get your drainage system and weed barrier in place first. This will allow you to customize the wall as you need to. This will save you time and a lot of frustration. Plus, you can use your retaining wall as a good security system holding everything in place.